Once upon a time, about six weeks ago, my husband sent me an email about a cute community play that could use a few extra young girls. 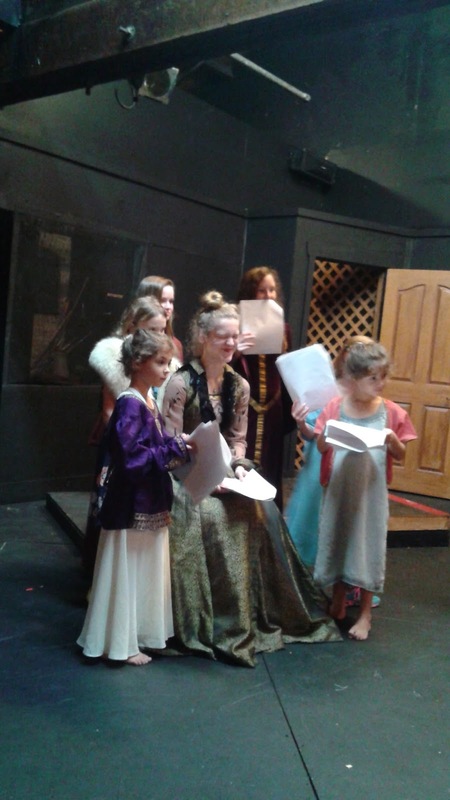 My kids love acting, and they rarely get to do it. This was a free experience, and not too time-consuming (just one practice a week, for two hours). Enter the worst parenting decision of my life. It's not that the play is bad, or that it's run badly or that anything, actually, is bad. It's just a horrible fit for us. As dramatic as my kids are, they are not trained in the way of acting, and they're still at an age where structure and order is very important for their sense of peace and well-being. And you cannot expect a group of lovely volunteers who do this in their very limited downtime to be able to provide that kind of structure and order. With just two hours a week to practice, and a dozen kids trying to hammer down their lines and costumes and props and cues in that time, unexpected messes are bound to crop up. It's been an excellent crash course in learning to go with the flow, but it's not a course my kids have been able to pass. And it's my fault. I know that should a chair be moved two inches from where it is "supposed to be" my children may have a problem with that. I know that if someone accidentally skips their lines, they may have a problem with that. I know that they have trouble existing in the same small space together for any length of time (ask my womb), without starting to fight to the death because they are just so sick of sharing every damn thing. I knew all this. And I also knew that signing us up meant we couldn't pull out without putting the hard work of others in jeopardy, as they would be counting on us to be able to do our part. I knew this. And I signed us up anyway. We've had some tantrums. We've had some rehearsals where I've had to drag one screaming twin outside, and some where we've left clothing behind because, dang it, it just got lost and we had to leave now or we risked tearing the whole theatre down with our seven-year-old angst. One of them had to go home wearing one sneaker this week. (The other has since been found, thankfully). We've had arguments over the Christmas tree changing position, emergency wardrobe malfunctions, and line bumbling. We've had a dead pig thrown on our feet accidentally, causing panic and mayhem. We've had hours-long rehearsals every day this week over the time when usually the girls would be eating dinner and after their long day at school. Exhausted and starving, how could I expect them to keep it together? Tonight, however, is the big night. Opening night. The night where my kids will say their lines, and sing their songs, and hopefully go with the flow. Will it be the worst ever? Will we ruin Christmas? But I do know that my girls have memorized the hell out of Carol of the Bells and Good King Wencheslas, so we've got to give it a go. And no matter what happens, I'm proud of us all for trying.